Everyone loves music and of course the Radio! With the world getting increasingly dependent on smart phones and Tablets, everything is changing. Radio, which used to be a good old device in our household, is accessible through our smart phones today, and what’s more is, it is just awesome. No matter how much we get into the internet music or other sources of songs and entertainment, Radio will always remain on the top of all because of it’s diverse nature and 24/7 availability. Smart phones have truly made it easier now to access to this great music hub and carry it wherever we go. With the latest release of windows 8, the competition is getting hotter in the smart phone market and to keep up with the major counterparts like Apple and Android, Microsoft is playing hard on its app market! The Android and Apple app markets are flooded with tons of music and radio apps. But that doesn’t mean Windows market is missing out. There are number of good radio Applications in Windows App market to install and listen to great music on the go! 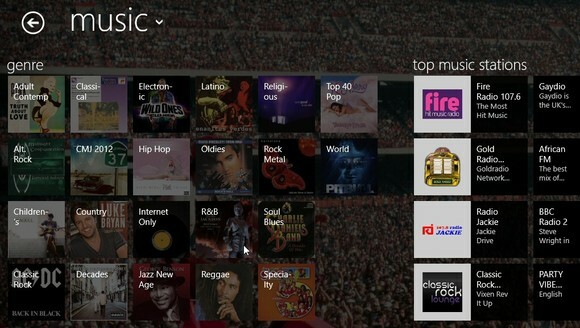 Let’s take a look at some of the best options available for you today with Windows 8 when it comes to Radio. It’s one of the best and better looking Radio App in the market. The tile based interface of the App for Windows 8 is simply awesome and it’s really easy to access the channels and navigate through! It offers over 60,000 radio stations around the world and over 2 million on demand programs to access to any time. Unlike other radio apps in the windows market, this particular one offers Podcasts as well which is an added advantage over the others. If you are looking for that one radio app which will give you access to thousands of radio channels without asking a single penny, TuneIn Radio is definitely the one for you! The app is free and you can download it from windows app market any time. Another great Radio App for great Radio experience on your windows 8 device. The interface of the app is fairly simple but yet looks elegant in some way. Navigation is very easy and the app offers access to hundreds of radio stations around the globe. The search feature allows you to search your favorite radio station and listen to the music instantly! Some of the other interesting features include displaying the Album art of the song being played, Radio station info, and also the option to buy the song or music from iTunes if you like it too much! This App stores your last session info and shows your recent stuff and last played stations, songs next time for easy resume. The App is totally free and you can get from the market for your windows 8 device. Another great open source Radio app to access the music on the go! It is fairly decent looking app with several cool options. You can access the Radio station here by country, language, genre or even artists. On offer are over 46,000 Radio stations around the world but the cool and easy to navigate system of the app makes accessing a real fun! The coolest thing is that it lets you pin or save your favorite stations to the main window for instant access. There is an additional options bar in the footer for better control of the radio experience. If you want to stream and enjoy hundreds of the radio stations across the world anytime and from anywhere from your windows 8 device, Radio World is the one for you! The major plus point of this Radio application is in its simplicity. It is build around a very simple and easy interface that is way different than the others in the ring. The app provides a set of stations based on different genres and categories. If you are into graphics and love great looking user interfaces, then this one is not for you. As I said, it is one of the simplest out there and you will only enjoy it if you love simplicity! Apart from the looks, the collections of top stations in each genre are really good and you will love it. Simple, yet elegant option for true radio junkies! One of the most complete and enjoyable music hubs out there! Slacker radio offers millions of songs and hundreds of stations from around the world to access from your win 8 devices anytime, anywhere! The app is free and there is no monthly limit to how many songs you can download or access to. Each App has something special in it to fall for. However, different people may like different features and you should go for the one that sounds most complete to you! All these apps are currently free and offer access to thousands of Radios Stations around world. Just choose your favorite one and start enjoying! This guest post is contributed by James Weaser. He is a software developer and now he is working on copy dvd program.